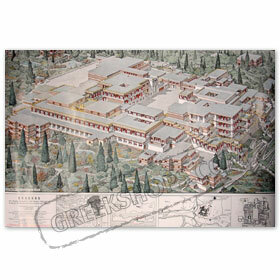 Floorplan of the famous Minos Palace in Knossos, Crete. Great detail, colorful graphics, and description of each room (on the back of the map). Palace History: Construction on the palace at Knossos, according to legend the palace of King Minos, was begun perhaps as early as 2000 B.C., and by 1900 BC, it was fairly close to its final form--a large single building with a central courtyard. During 1700-1450 BC, the Palace of Minos covered nearly 22,000 square meters (about 5.4 acres) and contained storage rooms, living quarters, religious areas, and banquet rooms. The Palace at Knossos was first extensively excavated by Sir Arthur Evans, in the earliest years of the 20th century. One of the pioneers of the field of archaeology, Evans had a marvelous imagination and a tremendous creative fire, and he used his skills to create what you can go and see today at Knossos in northern Crete.